The scheme of "Friends of B. 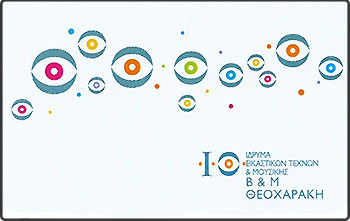 & M. Theocharakis Foundation for the Fine Arts and Music", comprising people who love art, invites and convenes the art & music lovers of - not only- Athens, around the Foundation's multi-disciplinary activities. The Group of Friends acknowledges the Foundation's important mission in the cultural life of Athens and it contributes by a subscription fee to the realization of the Foundation’s goals, which, as a non-profit organization, is not supported by public funds. Moreover and far beyond their financial contribution, what's more crucial is the moral support that Friends offer with their engaging presence in all the activities organized by the Foundation. Thus, they comprise a great company of civilized people who vigorously support culture and the arts. The Group of Friends are coordinated by a Committee and they enjoy a series of benefits; at the same time, they have the pleasure to enjoy a cultural and entertaining programme (e.g. guided art-tours, concerts, trips, art-events) that is organized especially for them. Read here about the benefits that you can enjoy, choose your subscription category and sign up now!